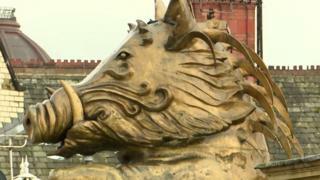 Bradford's boars: Why is a wild pig depicted across the city? A boar's head sits atop Bradford's coat of arms and all around the city symbols of the beast adorn buildings; but why is Bradford associated with a wild pig? It's a mystery that has puzzled BBC News website reader James Smith since his family moved from Watford to Bradford when he was 11. "I've always had a soft spot for the place," said the 47-year-old who now lives in Shrewsbury, Shropshire. "I'd seen boars on the city's shield and the football club's badge and it was just one of those things I'd wondered about." The city's crest is the badge of non-league side Bradford Park Avenue. It also once featured on the badge of Bradford City AFC before it adopted the symbol of the bantam. We took a wander around Bradford to see where else the crest and the boar cropped up. The crest has pride of place on the outside of City Hall but it also perches on a black drainpipe on the side of the building. In Centenary Square we ask Lucius Lawrence and his friend Wilburt if they know why it is there. "Oh the pig. I don't know what it is about and I came to here to Bradford in 1961," said Mr Lawrence, 79, who was born in Dominica in the Caribbean. "Bradford is a great place and very friendly but I need to get learning about it," he added. "I used to play cricket and the guys in the other team had a badge with the boar on." In Ivegate is by far the biggest and most magnificent example of the animal - a golden statue that crouches over the top of Ye Olde Crown. Lesley Hainsworth, 74, from Shipley was passing the pub when we stopped her to ask if she knew why the boar was towering over us. "I've never seen it and I'm surprised as I walk down here a bit," she said. "I've no idea, was it once that the pub was called something else like the Boar's Head?" At the bottom of Ivegate is a black gate bearing the Bradford coat of arms. We chat to 18-year-old Falek Ahmed, who goes to Bradford College. "It's there because there used to be loads of boars in the medieval times, lots of the land round here was forest and there were loads of them in there," she said. "I know about it because we did it in history at school and also I've seen things about boars and the city on the internet." What's being done to combat Bradford's 'Wild West' driving? Miss Ahmed is on the right lines. According to local historian Janet Senior, who wrote Some Bits of Bradford's History, the "tale goes back to the time of John of Gaunt, the Duke of Lancaster, because Bradford belonged to him". "Most of what is Bradford today was covered in woods and the thickest of these woods was Cliffe Wood," she said. "It's the area between Canal Road and Bolton Road and around what is now the cathedral, opposite Valley Parade. "At that point in time there were a lot of wild boars and they were causing a great deal of trouble because they would attack people who were walking about." Ms Senior said one particularly large and ferocious boar had made local people terrified. "The lord of the manor said he would give a reward to anyone who was able to kill the boar," she said. "A man named Northrop was walking in the area... He thought 'I could capture the boar and kill it and collect the reward'. "But a boar is rather big and he couldn't take it with him so he thought 'I know I'll cut its tongue out to prove I've killed it'." "But then another man came by and saw the the boar and thought he would take it to collect the reward," Ms Senior added. "So he cut the boar's head off and went off to the manor." However, the reward went to Northrop, as the lord concluded he had clearly killed the animal first. Ms Senior maintains the tale of the boar is a legend which has elements of truth to it. So what does Mr Smith think of the legend? "Bradford is not somewhere you'd immediately think about boars, so it's interesting," he said. "It's a good old-school fairytale. I think maybe the first guy should have cut the boar's head off in the first place. "It's odd to go for the tongue over the tusks or something. "I think it would be lovely if Bradford was still covered with woods and had boars running around everywhere." This video was created as part of We Are Bradford - a BBC project with the people of the city to tell the stories which matter to them. This story was inspired by a question sent in by a reader of the BBC News website. Use the form below to ask us your questions and we could be in touch.